The Screaming Pope: Can You Ever Forgive Me? Comedy is an aggressive activity. Its hilarity is bought at the expense of others. Look at Adam Sandler, Jim Carrey and Steve Martin. But even amongst bristly comedians Melissa McCarthy has always stood out. Her comic persona which is often that of the loner who's getting revenge (in Identity Thief she literally robbed other people of their lives) can be over the top. 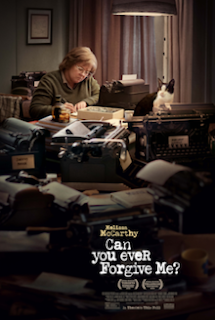 McCarthy’s latest outing Can You Ever Forgive Me?, based on the story of Lee Israel, a female Clifford Irving, is ur-McCarthy. It’s the comedian without the comic embellishment. Moviegoers expecting laughs were going to be sorely disappointed by the portrait of a lonely alcoholic biographer who forges Dorothy Parker and Noel Coward letters to pay the bills. In reality, Israel who died in 2014, might have done well to simply sell these witty impersonations for what they were. Instead, she ended up in federal court. The relationship between fraud and art was famously explored by Gide in The Counterfeiters and of course Picasso famously said that “art is a lie that tells the truth.” There's something almost emetic about Can You Ever Forgive Me?The character McCarthy plays is totally unappealing and you can’t help thinking that the movie is a kind of ars poetica in which the comedian is showing the pain residing at the core of her own being. These are enormous presumptions, but when you view a number of movies starring a particular actor or actress who time and after time communicates a similar persona you begin to feel the presence of something ineffable that’s not just a role. Seeing McCarthy's character turning the vagaries of her personality into art, you can’t help thinking you're watching a double header, with McCarthy playing both Israel and herself.